Developed in partnership with Mission First Tactical, the Adjustable Cheek Weld Kit adapts the Battlelink BACP Adjustable Cheek Piece to the FRS-15 Gen III Rifle Stock. The Kit mounts over the side plates on the FRS-15 Gen III and is compatible with all four configurations of the Gen III stock, including A2 and Gas Piston set ups. The FRS-15 Gen III Cheek Weld adjusts in 1/32" increments and provides a range of zero to 1 1/4" rise. An additional 5/8" can be obtained by installing the cheek weld in the lower hole positions, giving a total of 1 7/8" rise. 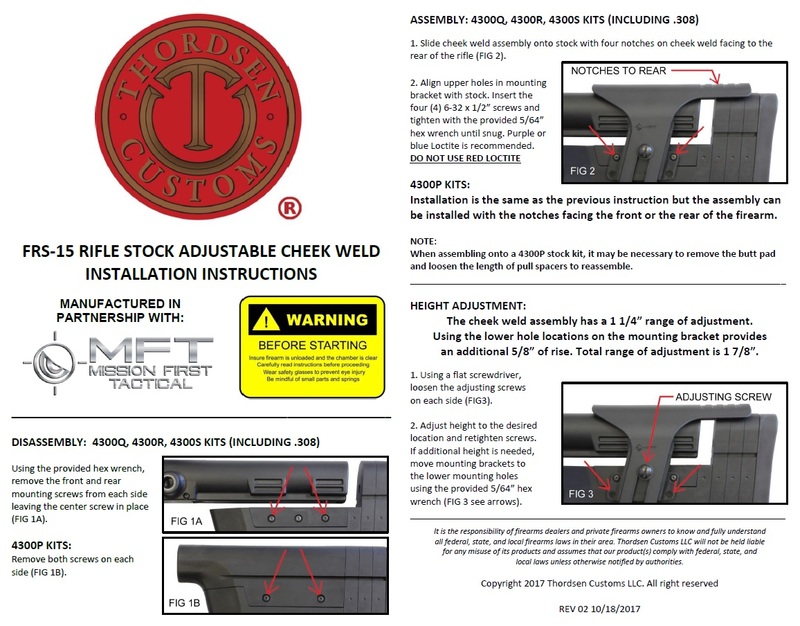 The FRS-15 Gen III Check Weld can be mounted in a forward facing or rear facing direction to accommodate rifles with or without a charging handle. Cheek welds are made of high strength polymer and available in Black, Flat Dark Earth, or OD Green.